Too Late, Hot Plate! Buh-Bye, Oh-8! I have no wonderful, witty way to wrap up the year. In fact, I am having a bit of trouble trying to remember just what happened. I am not going to risk pulling a mental muscle attempting to recall. It was either a year that flew by, or one that lasted forever. I think it might be the latter. I believe I finished between 35 and 40 knits this year. I suppose that is not too bad. There were a few things left unfinished, some things I never got around to knitting, and some knits returned to stash. I have quite enjoyed reading all the eloquent and touching send-offs of this year, and ushering in of the new one. That brings me to one of the best parts of this year--the blogging. No, I do not mean my blogging. My blogging quite lacks in quality. Still, I have had some fun with it. Reading what you all have written has been much more entertaining. Then there have been the comments. They are what make the blogging experience come to life. When you invite me to comment, you let me into your world. I cannot express how much I appreciate the ones you have made here. You have offered me encouragement and comfort in difficult times, and you have joined in with cheerful celebrations during the good. I have enjoyed the greater connections and relationships with other bloggers this year. You are wonderful. I thought for sure today was going to have more time for knitting. I only made it through the seventh repeat of budding lace. Still, that is half the number the pattern calls for, so I am making decent progress. I did have something of an artificial deadline of finishing this before the year changes, but I do not have my heart set on it. I am already thinking about my next lace. 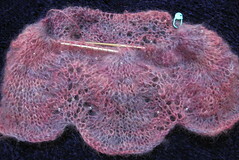 It might be the Lilac Leaf Shawl (Rav link) from Knitted Lace of Estonia, but I am not sure. Yesterday, I came across some yarn in the stash I want to use, and hope it will work with this pattern. Anyway, the yarn has been nice so far, and I am quite enjoying the Harmony tips I am using to knit the piece. I really like these wooden needles. Generally, I prefer my slick metal needles, but these are also good. I would not mind having more of the Harmony needles one day. I am not in a hurry to obtain more. I do have a nice supply of needles already. Speaking of the quest for acquisition, I was surprised the other day. I was browsing over on the elann site, and I felt a sudden urge to purchase. I was thinking about multiple sweater-quantities of yarn. Then I snapped out of it and moved on with life. It was weird. Then again, so am I. Rather than work on anything I have in progress, I decided that I needed something new. I know this can put the other projects in danger, but I am OK with this. Besides, what do I really have in progress right now? I need to rip back the socks because they are not working. The amigurumi tiger will happen when I am ready to pick up the hook. Ice Queen is temporarily frozen, and does not want to be touched. So, really, I have practically nothing on the needles. I am feeling a wee bit tense at present. I am working through it and preparing myself, but there is no getting around the fact that there is some stress. So, what is a good remedy to such a situation? I cannot think of anything better than lace. I thought of some special yarn, and after that it was a short leap to the right pattern. There was a brief moment of panic when I could not remember where I had placed my pattern binder. Yes, the quest for organization occasionally bites me squarely on the buttocks. Anyway, I am getting ready to wind the yarn and cast on for a new Swallowtail Shawl. This is going to be small, and probably a gift. I feel like this bright color is a good choice right now. 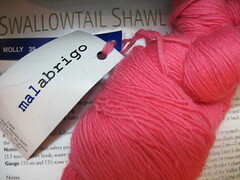 This will be my first time working with Malabrigo yarn. According to Ravelry, people have finished this pattern with this yarn over 100 times, so this is probably a safe choice. I am considering beads in place of nupps, but I am not sure. Maybe I will do the nupps, and then place beads in the peaked edging. That sounds better, but perhaps a bit too busy. We will see what happens. I still have a bit to go before I need to make a decision. Ah, now that is a comforting thought. I grabbed some fiber and the drop spindle today. I thought I would breeze my way through a pile of blue. The pile of blue had other plans. This was my first go-around with this fiber. It seems like it might benefit from a little more preparation. I have not branched out much in the fiber prep end of spinning. For one thing, I worry about ruining something. Since this stuff needs more help before I can really get down to spinning it, I am ready to jump in and see what happens. Yes, I might mess it up horribly, but if I do nothing, I will not spin it. The colors are too beautiful to just sit in a bag. The first step will be to wash the fiber. Actually, I first have to wash dishes so that I have access to the sink. Maybe I will just get out the wheel and spin some fiber that is ready now. I like the feel of my Red Brick Road sock, but I am not thrilled with the look of it. The mock cable does not show up well with this yarn. I will knit it a bit more before I decide whether to rip or not. The alpaca is so nice and soft, but it may work up better in a different stitch pattern. I have also been working on an amigurumi tiger. Now that I have the head and all of its details finished, I should be done with this soon. Sewing on the stripes has not been my favorite part of this, but it is turning out to be so cute. I keep looking at the other Chinese Zodiac critters, and I want to make more. Well, I need to finish up for the night and switch to weather-aware mode. They are predicting possible bad stuff for the middle of the night. I am going to make sure we have the volume up on the weather radio. I am operating on the theory that if we are prepared, nothing will happen. Also, I am hoping that we have earned some credit with all the recent power blips of late, and our electricity will stay on through it all. I suppose I could have explained the picture from yesterday and how it added to the specialness of the day. Those were my baby chickens and my sister. It was quite a day we all had together. I noticed some changes in my family. I am pleased to say that many of those are positive. I think I might have appeared off my game a bit, but I really enjoyed the day. Right now, my day-of-the-week sense is on its ear. Yesterday felt like a Saturday or Sunday, today felt like a Tuesday, and tomorrow seems like it should be Monday. How I came up with that last one puzzles me a bit. I think it might be that I am missing my Skanks, and I need to knit with them soon. It has taken me a moment to move on from all the gift knitting of late. I have had some difficulty thinking of what I want to make for myself. It is not as though I have been stuck thinking about things to knit for others. However, there was a moment yesterday when I was. Someone announced that I have never knit for her. Her statement was incorrect, but it stirred up many feelings. It nearly had me casting on something for her last night, but I worked my way through it. Now I am ready to grab the needles and knit something I have not knit since spring. I am knitting a pair of socks. The Red Brick Road (Rav link) socks look nice and easy. It is worked at a gauge of 6spi, so they might even be a quick knit. In continuing with the weird and different, I might even follow the pattern as written. I hope you spent the day the way that brought you the most meaning and peace! After a sleepless night of ripping out and re-trying the applied cord several different ways, I stumbled my way through today. I do not know if I could have slept if I did not have the hat to finish, but I am done pondering it. I am also done with the hat. The next time you see it, the son should be wearing it. I may be a bit punchy. I caught a couple of thirty-minute, poor-quality naps. I also did a favor for a dear, elderly woman by braving Wal-Mart to pick up three things for her. To give you a clearer picture of the scene, I will let you know that my right flip-flop broke just before I entered the store. Yes, the weather permitted flip-flops today. Earlier this week it was in the teens, and today it was in the sixties. There was also a possible tornado about five miles away from my home. Now I get weepy at Christmas songs and Christmas movies. I definitely need the sleep. It feels a bit odd this year. It is different, but I may have a bit more peace. *Happy Birthday, Tawn-Tawn! Congratulations on making it to the big 2-0! I discovered that I was not the only one to have given up on Knit.1. I checked the stores I recalled seeing the magazine in the past, only to find they no longer carry it. I cannot say that I blame them. I had never purchased a single issue. Anyway, today I was out shopping with my mom and sister. We will block out all memory of this endeavor save this--I finally found my magazine. We went to the movie theater with family tonight. The selection for the evening was Bolt. Everyone had a good time and enjoyed the movie. Some people overdid it with the popcorn. "I haven't hurt myself this much with popcorn since the last time we went to the movies." Still, we came home with the two large buckets refilled one more time. I have made my way over to the Darkside (Rav link) in cowl form. These were fun, quick knits, and I think I need to knit one more. I used Mission Falls 1824 Wool for them both. I love them, and hope the recipients enjoy them. I have come to accept that some of the mailed packages will arrive late. At first, I was a bit frantic, but when I saw I could not make it happen on time, I finally relaxed. Actually, I do not know if I gave up or relaxed. I suppose the result is the same either way. We have not done baked any cookies or made any candy. I figure that might happen next week if it happens at all. I keep thinking that some unexpected person or invitation is going to pop up and set us back to scrambling. Unless something like that happens, I think I am staying home. Have you been out there? It is more than a bit nutty. We have rainy, foggy, drizzly weather and it was nearly 70 degrees today. Sunday they have predicted a wind-chill of 15 degrees. The gift knitting has been great, but today it messed with the blogging. I had a post nearly ready to go when I realized it would have to wait. Life is like that some days. So today, you just get a picture of the inside of a hat. Tomorrow should be better. Because the daughter came over to spend the night, I missed getting out to knit with everyone tonight as I had planned. However, that does not mean the needles were idle, or that I knit alone. I was clicking away all evening, and someone else picked hers up again after a having laid them down years ago. Tanya asked what happened to the scarf she began in high school. She had taken it home with her, but brought it back over here a few months ago. I was able to surprise her by knowing right where it was. She was able to surprise herself by watching me knit a couple of rows and then she was off and knitting again. This is her first knitting. I did try to advise her to choose different yarn back then, but this was what she wanted. She still likes what she is making, but now understands what I tried to tell her. Later on, she mentioned how the long needles were getting in the way and that her hands were getting tired. I introduced her to circs, and she loves them. She hopes to finish her scarf in time for a trip later this month. Her knitting time has been abbreviated this evening as she is studying for her last two finals. After that, the schedule is open, and she should have plenty of time to knit if she so chooses. I seriously just had a brief panic when I could not remember the day of the week. Anyway, tinking back mohair is so much fun. It is almost as fun as trying to use too small beads. I have the Ice Queen back on track. It is now an enjoyable knit. I really do not feel too bad about taking out that round because it allowed me to change my beads. It was just a bit of a pain to do, but no more than fighting those little beads another two hundred times (or however many beads this thing takes). Also, I will probably be finding beads around here for years. I feel I exercised the greatest self-control in that I did not throw any of them, tempted though I was. I have also made this much progress on weaving in ends. There are just so many of them! I estimate there are about fifty more to go. Then I can work that applied i-cord edging. This has been a great hat to knit, and I feel a little bit of anxiety about giving it to the son. Speaking of him, I need to think of one more thing to get him for Christmas. In other news, today, I bought a Wii Fit for the Christmas Eve daughter. I was afraid we might not find one. If I had known she wanted one, I would have picked one up earlier and not had the stress. I continually change my mind about whether I will knit anything for her or not. I really think it depends on time, and whether I think she would like a Calorimetry. They have issued a freezing rain advisory nearby. Maybe it is a sign that I should knit an Ice Queen. Perhaps I am just avoiding the weaving in of a million ends on a certain hat. Of course, before I attempt to tackle any of these things, I need to do something about this headache. I had a great time at the Little Barn party today. The gift exchange went wonderfully. The package I brought was well received. As for my prizes, I received a great bag of fiber, an adorable lambie ornament, and the cutest little spindle pin. I recognized the beautiful blue fiber from a recent road trip my friends took. I love what they do with color, and I am excited to discover what this becomes. The folks at Little Barn gave us all bags of coffee, and it smells wonderful. It might be just what I need to finish the Christmas knitting. I'm just being silly, of course. I will not need to forgo sleep. I still have a bit to go, but it should be totally doable. Now that I have reached the crown, the rounds on Taki's hat are getting smaller and smaller. I think I am making a pair of felted slippers for Tanya, and they should be quick. I do have a few other little things I would like to make, but they are on the optional list. 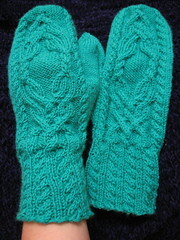 The mittens for me and spinning have helped to make the gift knitting come along. Taking these nice little breaks for myself have kept me from burning out on knitting for others. Now I am going to get back to knitting and watching It's a Wonderful Life. I may make it to the top of this hat by bedtime. I made it out to a yarn store today to check out the sale. It was all very lovely. I only purchased a little. My biggest task was to find something for the party out at Little Barn tomorrow. I started by looking through the spinning fibers. There were some lovelies. If the discount on the merino/silk blend had been better, I would have picked up a bag for me, and one for the gift. Anyway, it was very nice to listen to people decide their purchases. I saw some beautiful knitting in progress, and felt the tension amongst those trying to finish many gifts over the next 1 1/2 weeks. When I arrived at the store, I was cold. I had on my mittens, coat, and a sweater over my regular clothes. My husband insists I am coming down with something. I am resisting. As I warmed up, I kept stacking my belongings on a chair. When I checked out, my pile of clothes was bigger than my pile of purchases. I finally decided on the Flower Basket Shawl pattern and a skein of Dream in Color Baby in the Ruby River colorway. Lovely, isn't it? I hardly want to give it away. Therein lie my win-win thoughts. If I keep it, I have a wonderful new pattern and fabulous yarn. If I go to the party, I will be giving a great gift (I love to give gifts! ), and it is probably good that I get out and socialize. First, we had the rain, and now we have the cold. A local newscaster said something to the effect that whether it freezes depends on what happens with the temperature. She said this while holding up a giant thermometer. I have kept busy today, but have almost nothing of interest to show. I am nearly done with a garter scarf. I finished another Calorimetry. I have made my way through about 30% of the next bobbin of Indian Summer singles. Can you stand the excitement? I am thinking this might become a three-ply yarn. If that is the case, I will need to spin a third bobbin of singles to go with these two. Oh, dear! Did I really just write that? The local newspeoples have eaten my brain! I have been working on a possible present for a friend. I really hope it works out the way I have it planned. I cannot write anything else about it or show pictures, as she has been known to peek in over here. There is a holiday shindig on Saturday at Little Barn, and if I am to attend, I need to get the gift together. There is going to be one of those gift exchange things. I am not such a huge fan of them, but sometimes they work out well. I had wanted to order one of those Andean Chullo Kits, but when I last checked they were listed as unavailable until next year. If I have my way tomorrow, I am getting out of the house and try to find adventure. There is a sale at a yarn store, and I may check out the offerings. Also, is the new knit.1 out yet? That's not a question I thought I would ever ask. Anyway, I caught the preview, and it looks like there are good patterns in it. *We have both been experiencing temporary online outages. What it means for you is I cannot seem to come up with coherent comments to write on your blogs. What it means for me is an actual trip to the post office. If you see me whispering into my new mittens, I am probably just checking to see if they really are magic. Also, it might be a poor choice to surprise me at that moment. We are getting ready for a dip back down to colder weather, and I am glad to have these finished. Knitting these mittens for me has helped with the gift knitting. I feel ready to get back to knitting for others. Thank you for all of the kind words and support. I have taken the day off to rest. I will get back online Wednesday. Actually, I am not moping. I feel bad because of a crushing disappointment. It is one of those times when my feelings reflect reality. There are many things that I do not understand, and this is one of them. The solution to this has never been in my hands, and in some ways, it is not something that can be fixed. What I do have is the choice and the power to continue in love. I suppose that is enough dancing around a topic I cannot discuss with everyone. I am home, and that is good. I left my pillow at the hotel, and that is not good. Perhaps I am about to find an even better pillow. Yes, I am reaching. I just heard the mail truck, so I will get the kettle going while I walk up to the mailbox. Then I will sip some tea or cocoa and treadle away in silence. That seems to be the right thing to do. The journey is going well, so far. I put on my red-light headlamp and knit the whole way down here. During the drive, I finished another hat and made it about a third of the way through a new Calorimetry. Once we settled ourselves in our room, (yay, wifi!) I decided to go for a nap and then a little more Calorimetry. I knit it to the midway point and set it aside. Unless I am awake in the middle of the night looking for mindless knitting, it will wait for tomorrow. I plan to knit on my right mitten until I go to sleep, which should be soon. I am going to change the Susan Bates Silverado needle out for a Knit Picks fixed circular. Those cables will go even more smoothly with the pointier tip. I remembered to bring a highlighter so I can mark out the rows on the chart as I make my way up the mitten. To think, I could be wearing new mittens soon. Since none of my knitting today has been particularly picture-worthy, I leave you with something from Friday night. The birthday party was wonderful. Mom loves her new lace. My niece was also thrilled with the scarf I knit for her. Today is her birthday. Happy 4th Birthday, KOH! I am about to be away from home until Monday. Right now, the biggest questions in my mind revolve around what and how much knitting to pack. I will probably bring more than I need, but that is preferable to running out of things to knit. Most of this will be mindless or low-level concentration knitting, but I am also bringing my right Magic Mirror Mitten. I finished it this morning, and was able to block it and have it ready for the party this evening. I like this yarn, and love this pattern. Even though there was pressure associated with the bumpy beginnings of this project and the serious time-crunch, this was such a great knit. I think knowing that I was knitting this for my mom added to the enjoyment. This was my first experience knitting with Dream in Color Baby. I like it. It was a pleasure to knit with, I like the coloring, and blocked into beautiful lace. I am glad I decided to knit this on US 6 needles. I worked twenty-five repeats of the center chart, and the piece ended up being around 19"x68" after blocking. My only other modifications were the two eyelet rows I omitted, and I did not create the scallops on the sides in the blocking process. I do not know why mailing things is such a deal for me, but it is. I am determined to get these out of my home and to the places they belong. I am a bit embarrassed at how long a couple of these items have waited. I have to write notes for a couple of the packages, but that should not take long at all. I love that I can take care of the rest of it online. I do not even have to drive to the post office. I can use the carrier pick-up service. Still, it will probably take me one more day to finish this task. I am ridiculous. Project monogamy has made the blogging this week a little more difficult. I have been working Mom's lace. I have developed a nice rhythm with it. It feels like I am moving quickly through the center. It is easy to go from thinking, "I'll just go to the end of this repeat," to finding that I went past that and I am back to the nupp row. Once I knit the nupps, I might as well knit to the end of the chart, and the cycle continues. These are the most enjoyable nupps of my knitting life. Anyway, I am now hopeful that this will be a birthday present. I have passed the halfway point. Wednesday night knitting had a happy bonus. Life finally allowed a friend to get out to knit with us. It was so wonderful to see her. I have missed her very much. The night flew. The knitting grew while we caught up on things. The next thing I knew, the barista alerted us to the fact that the store closed ten minutes previously. Another thing that happened tonight was a request for a progress shot of the llama earflap hat. Now, with such kindness and flattery, how can I refuse? Tonight was the 2nd annual Wear-A-Hat Night at Skanky Knitting. This is always the first Monday after Thanksgiving. All of that wool made being next to the door more tolerable. I had hoped to have a different hat to wear this year, but it was not to be. I am formulating a plan for a small knitalong after the first of the year. If I can make it happen, I know which hat I will be wearing next time.